I can still remember that harsh memory from recent past when we had made some arrangements for watching football match at my place with a bunch of friends. We were pretty super excited to watch the game, but one of my buddies was a bit too drunk. He just smashed the LCD with a throw of wine glass, later he realized that he has done something terribly wrong and he apologized but what could have been done at that time other that tolerating? But I realized that I made a huge mistake, I had no proper TV stand or console for my LCD, if I had one that would have kept us away from the device due to the height and proper vision, but that night we were pretty close to the LCD. In a nutshell I would strongly recommend all of you guys, never leave your device alone, make some special arrangements, it would also add beauty, and would protect your expensive device too. 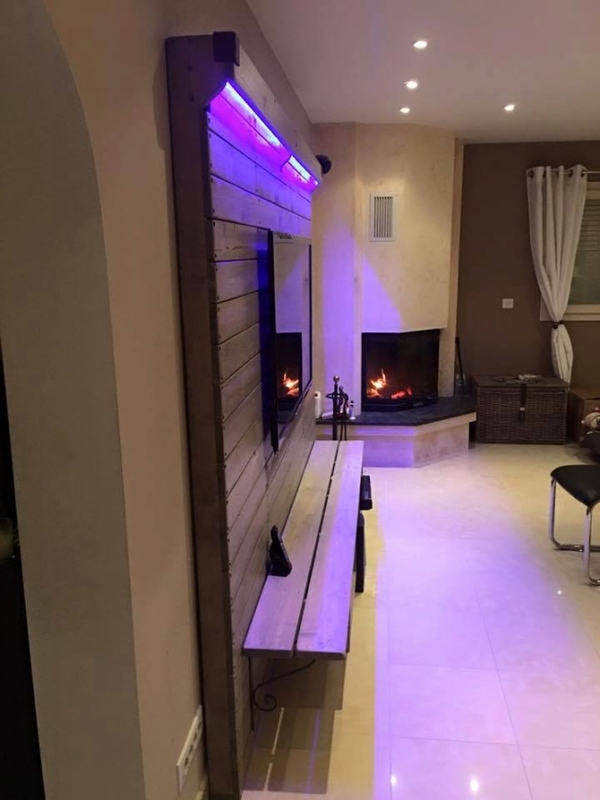 Remembering the previous harsh memories I just thought to make a pallet wall console for LCD tv that would keep your device pretty away from the immediate access. This would ensure the safety of device, and would also compliment the rest of your room interior. We have just planned to keep it as simple as possible, but this would also provide you with ample storage space for some additional electronic devices that might be connected along with LCD. 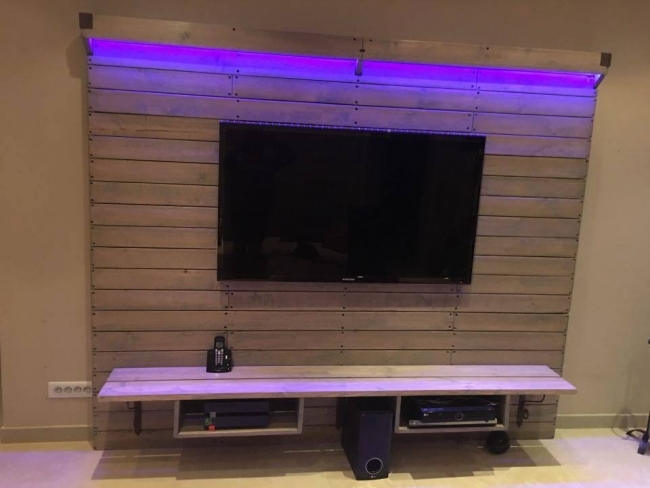 This is probably the simplest yet cutest TV console made with wood pallet so far, we have a wooden wall background, a long wooden bar below the device, and a couple of built in drawers that would camouflage the internal devices. With a light blue light tone, this really looks amazing, make you feel like sitting in some dolby theatre.